The Jones County Health Department has published the 2016 State of the County Health Report (SOTCH). This report summarizes how the Jones County Health Department and local partners have been working on their priority areas over the past year. This document provides a summary of updated health statistics and the progress made towards the health priorities of Obesity, Mental Health and Substance Abuse. A copy of the 2016 SOTCH can be found below. 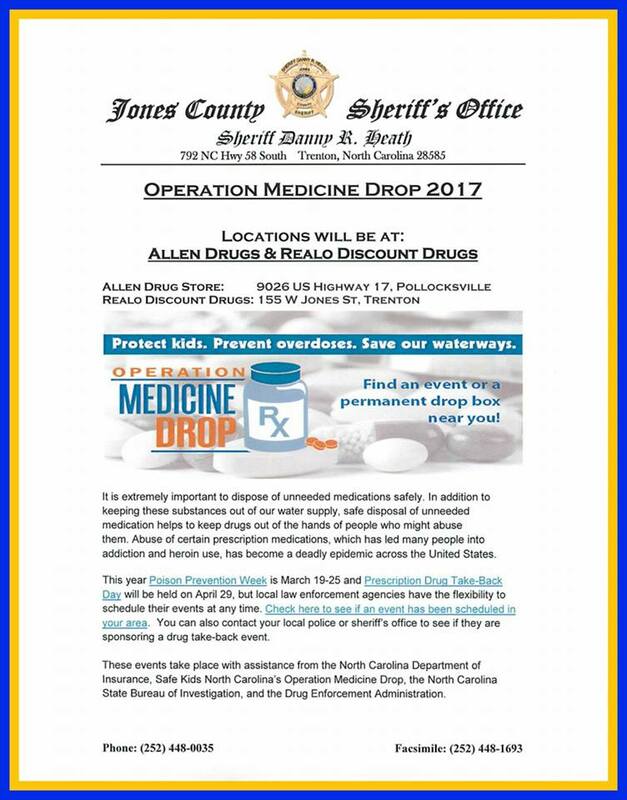 On Saturday, April 29, the Jones County Sheriff’s will give the public a chance to prevent pill abuse and theft by ridding their home of potentially dangerous expired, unused, and unwanted prescription drugs. Bring your pills for disposal at Allen Drugs at 9026 US Highway in Pollocksville or at Realo at 155 West Jones Street in Trenton. This service is free and anonymous. The Jones County Health Department will be holding their Fall Rabies Clinic on Saturday, May 6, 2017, from 9:00 am to 12:00 pm. 1 and 3-year vaccinations available. The fee is $7.00 per animal (cat or dog). For more information, please call (252) 448-9111. The Smile Mobile will be in Jones County from approximately March 6, 2017 –March 17, 2017 (shorter or longer dates based on client demand). The Smile Mobile is a mobile dental unit that travels to many different school locations with a primary focus on treating children and pregnant women within Craven, Jones, and Pamlico Counties. The Smile Mobile sees children ages 1-20 who have Medicaid, NC Health Choice, and Self Pay. We also provide services to pregnant women who are patients at the Health Department. Please note: Pregnant women are the only adults seen by the Smile Mobile. Dental Services include dental examinations, cleanings, x-rays, fluoride treatments, oral hygiene, sealants, fillings, stainless steel crowns, and extractions. Please call 252-670-8608 to confirm the location or to schedule an appointment. Text4baby is a free mobile information service designed to promote maternal and child health. An educational program of the National Healthy Mothers, Healthy Babies Coalition (HMHB), text4baby provides pregnant women and new moms with information to help them care for their health and give their babies the best possible start in life. Women who sign up for the service by texting BABY to 511411 (or BEBE in Spanish) will receive free SMS text messages each week, timed to their due date or baby’s date of birth.